Dot your garden or the plants in your sunroom with charming wildlife using these Ancient Graffiti Spice Bird Plant Picks. This set of 6 staked, ceramic figurines is fantastic for adding to a few potted flowers or herbs, creating a focal point in your area with ease. 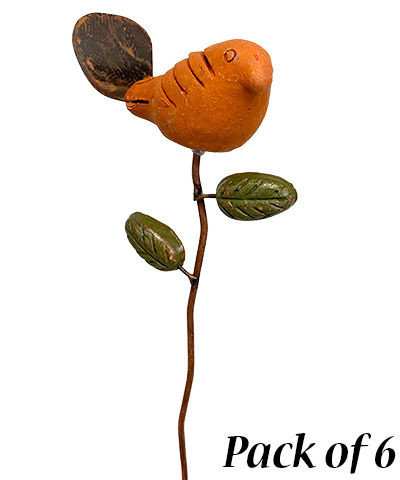 Each stylized, ceramic bird figure rests atop an 11.75" long, metal shaft, and their expressive faces capture attention in moments. A metal, upward tail creates a fun silhouette, and two stone leaf shapes further the natural motif. Each shaft installs into soil in moments, and the soft orange tone of the birds contrasts the hues of your herbs or flowers. Crafted from natural materials, these units are sure to showcase your love of the outdoors, while creating a physical barrier, discouraging birds from nesting in the plants. Celebrate your feathered friends throughout your yard or in your potted plants using these Spice Bird Plant Picks. Note: This case pack contains 6 of the Ancient Graffiti Bird Plant Picks, Spice.